Playground campaigners, councillor Matthew Tomlinson, with Aniela Bylinski Gelder, centre, and Kim Snape, the prospective Labour Parliamentary candidate for South Ribble. Campaigners are stepping up their fight to save Leyland’s playgrounds from being redeveloped. Objectors worried about the future of Leyland’s play areas are expected to turn out in force at full council next month. Organisers of already hefty petitions launched to try and safeguard the areas are urging more support. Two play areas in Leyland have come under threat - Balcarres Road and Bent Lane. He said childhood obesity and air quality were important issues to take into consideration. Balcarres campaigner Aniela Bylinski Gelder, 38, said there were four main issues in fighting for the green space to remain untouched - recreational; mental and physical wellbeing; air quality; and drainage. She said it was vital for mental health, as well as physical health, adding that Turpin Green Lane, a main artery to the M6, was an air quality blackspot and that not only new homes add to the problems, but drainage could be affected, too, in an area she descibed as “a sink”. A petiiton received more than 900 signatures online and 100 from local residents. “Taking everything into considertion, I think it would be irresponsible,” she Aniela. Jo Hindle-Taylor has launched an online petition on change.org to South Ribble Council for the Bent Lane site, with a Friends of Strawberry Valley Park Group set up to revitalise the green space. 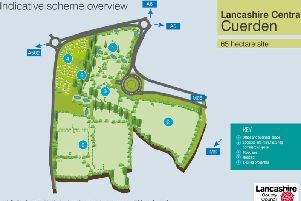 South Ribble Council wrote to residents advising them that it was “considering all appropriate uses” for several pieces of open space which did not form part of its green links strategy – including whether they could help “address the gap in affordable homes” in the borough. The council has published a 10-year vision for the network, which will be made up of a series of paths designed to be multi-use and where no individual user group has priority.